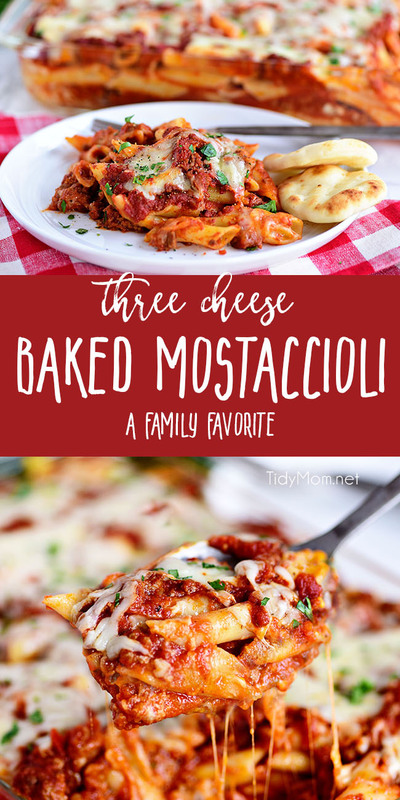 This family recipe for Three Cheese Baked Mostaccioli is a wonderful cheesy pasta dish the whole family will be asking for again and again! It’s also a great dish to take to a pot-luck or new mom. Both of our girls have left the nest (well, one is actually still in college), and Three Cheese Baked Mostaccioli is what they always request for holidays and Sunday dinner when everyone is home. It’s delicious comfort food, and so easy to make ahead of time too! This Baked Mostaccioli is a recipe that was always a specialty of my sister-in-law Bobbie. I’m so fortunate to have gotten her recipe years ago before she lost her battle with breast cancer. We think of Aunt Bobbie EVERY time we eat her WONDERFUL Mostaccioli. This is one of those recipes I like to make when I want to bring a family in need a hearty meal, or dinner for a new mom and her family! It gets rave reviews from everyone, and I even made a video tutorial where I share Aunt Bobbie’s secret and show you how to make my family’s favorite baked mostaccioli. This cheesy pasta dish needs to happen in your kitchen. It makes a big 9×13 pan, but you can split it into two dishes (2qt or 8-inch square) and share it with a neighbor or friend in need! This meal ALWAYS gets people asking for the recipe, and once you try it, you’ll understand why!! You want to start by cooking your pasta and cook it until al dente. What is al dente? It simply means that the pasta is still slightly firm. Since you will be baking this dish, you don’t want your pasta too soft and mushy! While your pasta is cooking, you can brown the meat in a large saucepan or deep skillet. You’ll be using a pound of each; ground beef and salsicca (Italian sausage). Drain the grease and add your favorite red pasta sauce and simmer. You can use any jarred pasta sauce you like (my family prefers Ragú because that’s what Aunt Bobbie always used). OR, you can make your own red sauce. I love these recipes for easy homemade marinara sauce, this vodka sauce, and this Pomodoro sauce. Once the pasta is cooked and drained, add half to a greased 9×13 pan. Now you are ready for Aunt Bobbie’s secret step to fabulous cheesy mostaccioli. You are going to add cheese right on top of the pasta, so the cheese bakes right into the noodles. Tear up a few slices of American cheese and Mozzarella and place directly on top of the pasta. Pour half the meat sauce over the cheese and noodles, then layer again, this time using American Cheese and Provolone over the pasta. Cover the second layer of cheese and noodles with the remaining sauce and top with more Mozzarella. Bake for about 45 minutes. If you don’t want burnt cheese on the top (my family loves the cheese burnt) then baked covered for about 30 minutes then remove foil and bake uncovered for an additional 15 minutes, until bubbly and cheese is melted. If making this dish in advance, cover and refrigerate until ready to heat. If cooking from cold, you will want to increase the baking time. Bake for about hour, until bubbly and cheese is melted. Can mostaccioli be frozen? Yes!! 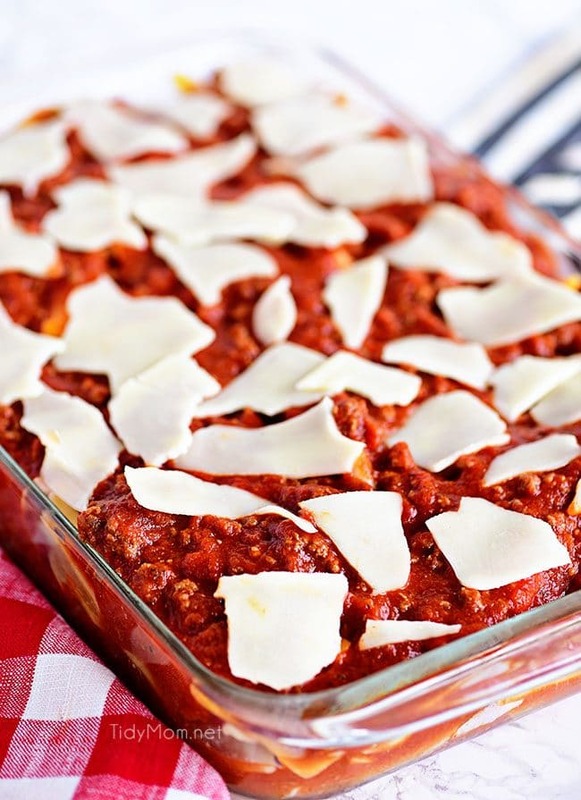 To freeze Mostaccioli–completely assemble mostaccioli in a disposable foil pan (or line a baking dish with foil). Cover the top of the pan with aluminum foil, and place in freezer. Label and date with freezer tape (don’t forget baking temp and time). When ready to enjoy, defrost in the refrigerator overnight. Remove foil and bake as directed. (you may need to add 10-15 minutes cooking time because of the refrigeration). Can I make mostaccioli the night before? Yes, you can make it ahead (I love to do this for holidays and parties). Simply follow the directions, but do not place the mostaccioli in the oven. Instead, cover the dish with foil and refrigerate until ready to heat. If cooking from cold, you will want to increase the baking time. Bake for about hour, until bubbly and cheese is melted. 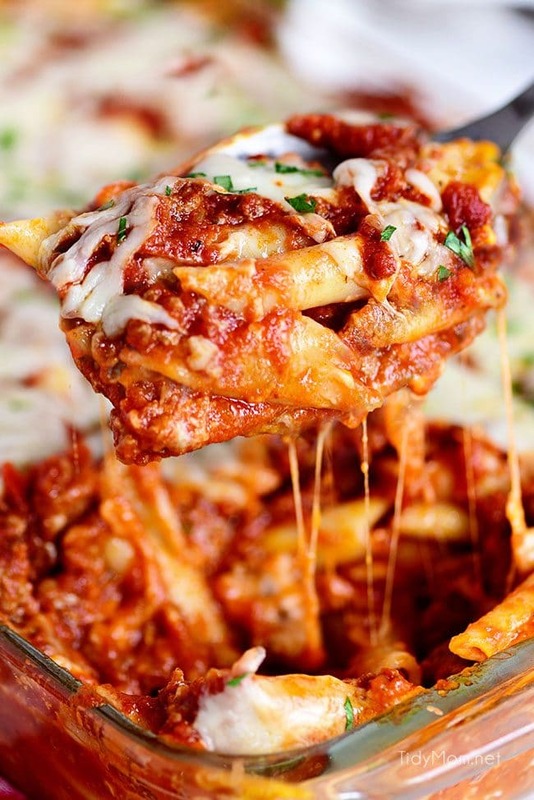 Can I double or triple this recipe for baked mostaccioli? Certainly! I would definitely use 2-3 pans (or buy disposable foil pans) and just double or triple all of the ingredients. Bake time will be the same 45 minutes, or 1 hour if baking from cold. Can I make half the recipe? If I only want half I will just make a full recipe and place it in two pans (2-quart or 8-inch square) and bake for the same 45 minutes. You can then freeze one or share with a neighbor or friend. What is mostaccioli pasta? 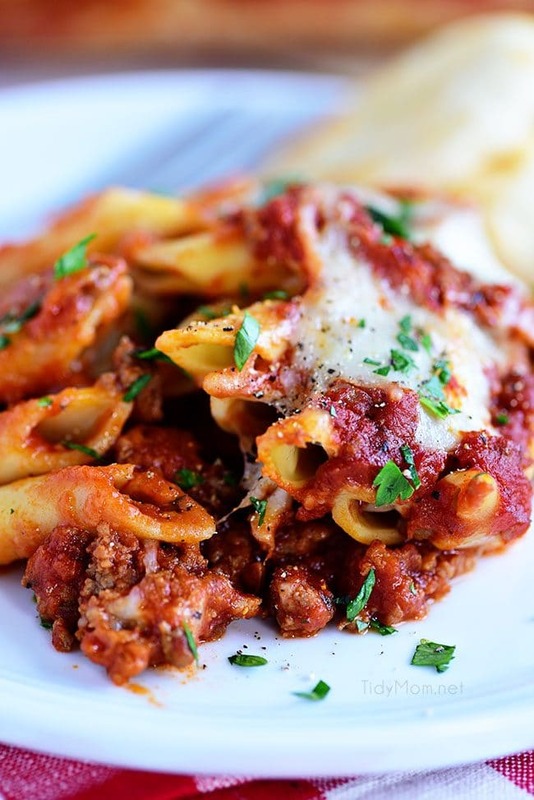 The name mostaccioli is found only in the U.S.; the pasta is known in Italy as “Penne Lisce,” a specialty of the Campania Region in Southern Italy. While Penne and Mostaccioli are both tube-shaped with angled ends cut to resemble a quill or pen point, Penne are ridged and Mostaccioli noodles are smooth in texture. Can I use penne instead of mostaccioli noodles? Yes!! Penne pasta is actually more universally known. The ridges of penne allow the pasta to cling to the sauce. 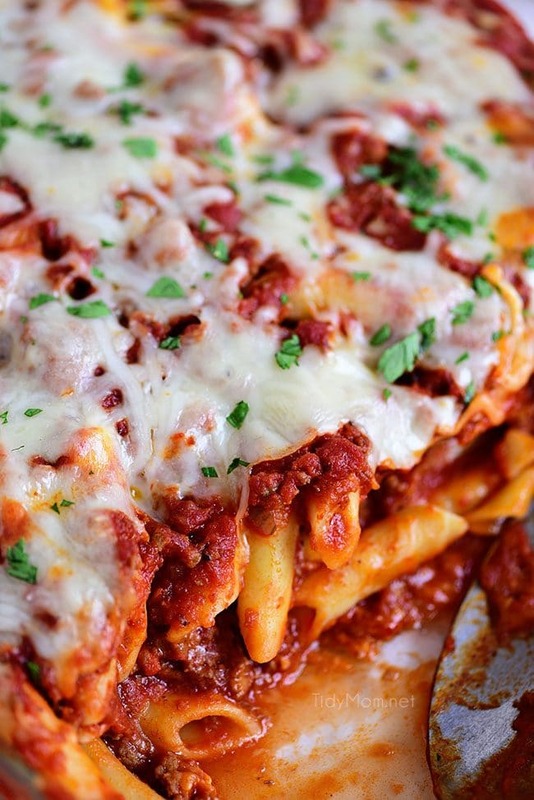 Is mostaccioli the same as ziti? Yes, Mostaccioli is a diagonally cut pasta while Ziti is a blunt cut pasta with the same smoothness. You can use either, in this mostaccioli recipe. What goes with mostaccioli? We usually serve an easy green side salad, garlic cheese bread and desserts like Triple Chocolate Caramel Bars or Chocolate Chip Gooey Butter Cake. Delicious Roasted Red Pepper Fettuccine with Garlic Smoked Sausage is a sure way to win any pasta lovers heart! This dish is full of flavor and on the table in 20 minutes or less! Cheesy Ravioli Bake Casserole with Chicken is easy to make and impossible to resist, making it the perfect weeknight dish. Cheese ravioli, marinara sauce, chicken and lots of cheese, all layered and baked until bubbly and gooey! Your taste buds will be tantalized with each bite of this Sweet and Spicy Glazed Pork Tenderloin. Juicy and flavorful, it’s a little sweet and a little spicy and a breeze to make. You’ll have dinner on the table in about 30 minutes. Everyone will love this Instant Pot Chicken Alfredo and it will be ready in 20 minutes with only one pan dirty! Easy Lemon Garlic Butter Chicken Thighs Recipe is a one-pot chicken thigh dinner guaranteed to impress even the pickiest eaters – bursting with rich lemon garlic butter flavor and crispy, crunchy chicken thighs in under 20 minutes. Steakhouse Pork Chops are tender, juicy, and packed full of wonderful flavor. The best part about these pork chops is they take under an hour from start to finish. No crazy prep work. Just marinate, rub and grill. Delicious pork chops that are better than any restaurant on the table in under an hour. This dish is good from the oven, but it’s even better to eat for days leftover, or you can even freeze leftovers. It feeds a lot of people so it’s perfect for a big family or a party. 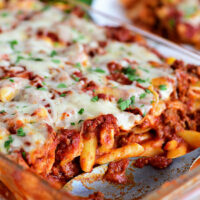 CHECK OUT HOW THREE CHEESE BAKED MOSTACCIOLI RECIPE IS TO MAKE! WATCH THE VIDEO! I created a fun little group on facebook and I’d love for you to join in! It’s a place where you can share YOUR favorite recipes, home tips, creative ideas and ask questions and see what’s new with TidyMom! If you’d like to check it out, you can request to join HERE. Be sure to follow me on Instagram and tag #tidymom so I can see all the wonderful TidyMom recipes YOU make and tips YOU use! 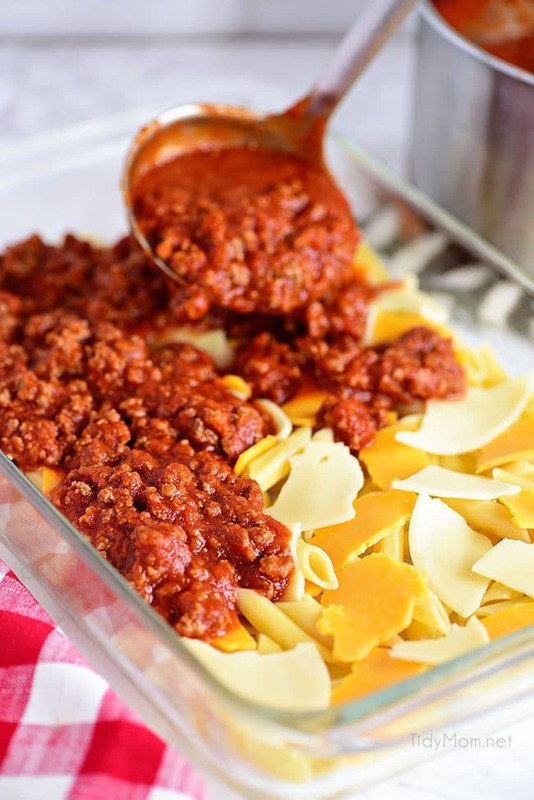 This family recipe for Three Cheese Bake Mostaccioli is a wonderful cheesy pasta dish the whole family will be asking for again and again! Cook pasta according to package directions; drain and set aside. Meanwhile, using a large saucepan or deep skillet, cook ground beef, salsitccia, and garlic salt over medium heat until meat is no longer pink. Drain grease. Add sauce and Italian seasoning to meat mixture and bring to a boil. Reduce heat and let simmer uncovered for about 15-20 minutes. Grease a 9×13-inch glass dish and then layer half of the cooked pasta into the bottom of the greased dish. 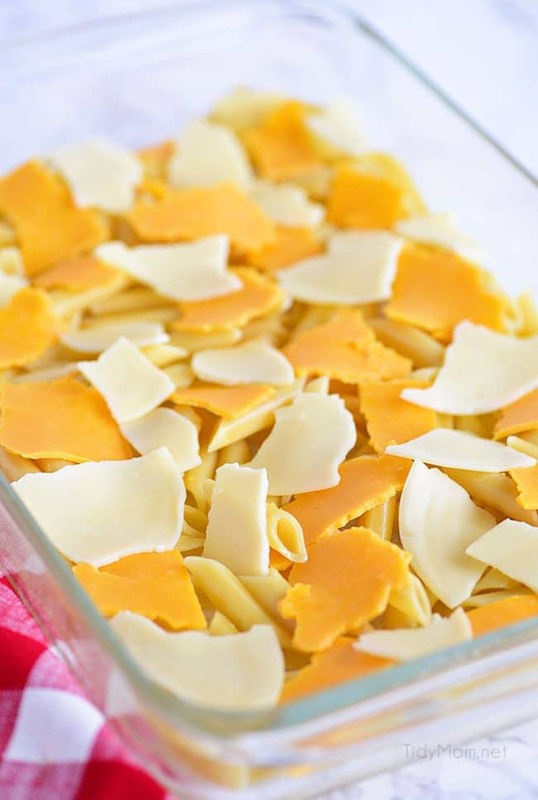 Top with 3 pieces of American cheese and 3 pieces of Mozzarella cheese each torn into small pieces (placing the cheese on the noodles is a VERY important secret step). Pour half of the sauce over the cheese and pasta, using a spoon to cover the noodles. For the second layer: add remaining pasta, then this time 3 pieces of American cheese and 3 pieces of Provolone cheese, each torn into small pieces. Pour remaining sauce over top (again, use a spoon to cover the noodles) and top with remaining Mozzarella cheese torn into smaller pieces. Bake for 30-45 minutes or until hot and bubbly. Let sit 10-15 minutes before serving and enjoy! 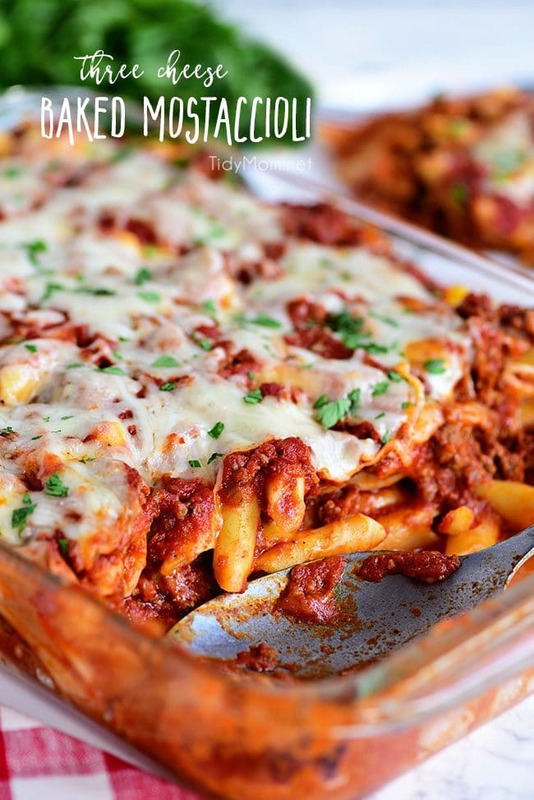 *This three cheese baked mostaccioli recipe was originally published on TidyMom on November 30, 2009 and the photos were updated in August 2018. Measuring Flour for Cookies- Works for Me! fantastic! I love dishes like this. What a yummy looking dish–I love having recipes that remind me of someone I love! Handed-down recipes are so wonderful–they really keep us connected to the past…Thanks for sharing this–off to check out "Bake at 350"–didn't know about that site! Have a lovely day! YUMMY, now that sounds like something that would get devoured quickly in my home. Happy Monday! THat sounds like super yummy comfort food! Thanks for posting this! my hubby would love this. YUM. What a sweet tribute! I love how food connects us to our loved ones. I am telling you…if I popped this out of the oven and served it to Greg he would absolutley be THE happiest man ever! Guess I need to whip this up! How special to have a recipe to reminding of your Aunt Bobbi. I'm so sorry about your loss. It's wonderful that you have her recipe and it sounds delicious! That looks yummy! I have never used sliced cheese on mine, great idea. And I marked my calendar for the Bloggy Christmas Bash! Looks yummy!!!! I put it down on my to try list!! Thanks so much for sharing your sister in law's special recipe with us. It looks so yummy! How wonderful for you to have this recipe as a sweet memory of her. Thx so much for sharing, I feel like this one is uber special since it was you sis-in-laws..
Oh Lori what a sweet comment – I'm glad you enjoyed it!! Thanks so much! I will try this tonight! I’m adding this to my recipes to make list! My mom made mostaccioli aaaaaaalll the time, like every week for years. Such a great throwback! I would like to triple this for my Daughters Graduation……..do I just triple everything? Also can this be in the fridge overnight before being cooked? Last how much longer would I cook it for?? Thanks for any help! to triple the recipe, yes you would triple all ingredients. I would make it in 3 pans and cook them at the same time as listed in the recipe. You can make it ahead of time and keep it in the fridge, I would just pull it out about an hour before cooking to let it get closer to room temp before putting in the oven. Enjoy! this has been a family favorite for years. All that cheese totally has be drooling! I’m totally trying this! This is my kind of comfort food. Adding it to our menu this week! This is the kind of hearty meal my whole family enjoys and I love all of that cheese! I cannot WAIT to try this recipe! I looks divine! This looks so delicious – I know my kids will love it!